Azerbaijan's entry will act in the second part of the second semi-final, Trend Life reported. The second semi-final will also see performances of Russia, Albania, Lithuania, Macedonia, Malta, the Netherlands, Norway, Croatia, Austria, Armenia, Denmark, Ireland, Moldova, Romania, Switzerland and Sweden. Representatives of Slovakia, Belarus, the Czech Republic, Montenegro, Cyprus, Serbia, Finland, Poland, Hungary, Estonia, Portugal, San Marino, Spain, Georgia, Greece, Australia, Belgium, Ukraine and Greece will perform in the first semifinal. Ten participants from each semi-final will reach the final, where representatives of Israel, France, Spain, Germany, Italy and Great Britain will join them. The show will consist of two semi-finals on May 14 and 16, and the final on May 18 2019. The motto of the competition - Dare to Dream. 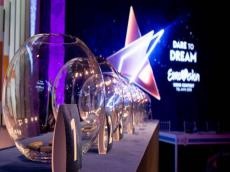 Tel Aviv received "keys" to Eurovision in handover ceremony on January 28. Deputy Lisbon Mayor Duarte Cordeiro handded the keychain to Tel Aviv Mayor Ron Huldai.